Sustainable Fairfax Highlights for 2018! Special Guests: Filmmakers William Sorensen, Stella Kwiecinski & Nancy Econome; David Keller, Bay Area Director of Friends of the Eel River; and Huey Johnson of the Resource Renewal Institute. Questions & Answers follow the film. We are pleased to present this timely film, especially relevant as the California drought worsens. Over 25% of the water we use in Marin comes from the Russian River through the Sonoma County Water Agency. The film is a non-profit project produced, written and directed by residents of Sonoma County who like most everyone on our planet, depend on a watershed to live. The film explores the diverse forces which have come to shape one of California’s iconic rivers – forces which impact rivers and watersheds throughout the world. 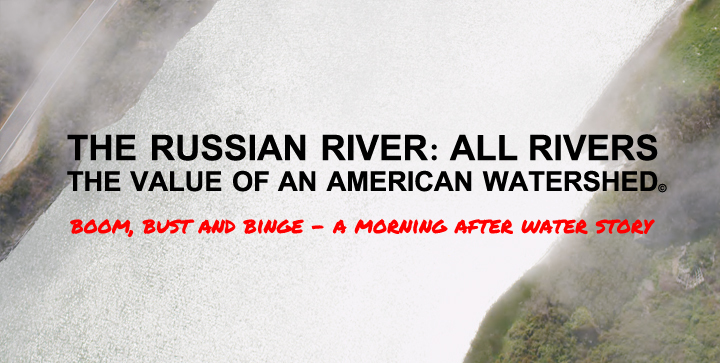 It examines how the Russian River has been used, and what the consequences of that use have been. Beyond examining its exploitation as a resource, the film revels in the watershed’s profound, often forgotten, beauty. What can we learn from it? Why are we drawn to it? The film features Maude Barlowe, Brock Dolman, David Keller, Don McEnhill & Marty Griffin.